A delicious homemade treat, these yeast-raised doughnuts are worth the time and effort! Have liquid ingredients at 80°F and all other ingredients at room temperature. Place ingredients in pan in the order specified in your owner’s manual. Select dough/manual cycle. Do not use delay timer. Check dough consistency after 5 minutes of kneading. The dough should be in a soft, tacky ball. If it is dry and stiff, add water, ½ to 1 tablespoon at a time. If it is too wet and sticky, add 1 tablespoon of flour at a time. After dough cycle is complete, continue with Shaping, Rising and Frying instructions below. See our Bread Machine section for more helpful tips and information. Dry mixture: Combine yeast, 1 cup flour, salt and sugar in medium size bowl. Liquid mixture: Combine milk, water and oil in a microwave-safe dish or sauce pan; heat to 120-130°F. Hand-Held Mixer Method: Combine dry mixture and liquid mixture in mixing bowl on low speed. Beat 2 to 3 minutes on medium speed. Add egg; beat 1 minute. By hand, stir in enough remaining flour to make a firm dough. Knead on floured surface 5 to 7 minutes or until smooth and elastic. Add additional flour if necessary. Place dough in lightly oiled bowl and turn to grease top. Cover; let rise until dough tests ripe. Continue with Shaping, Rising and Frying instructions below. Stand Mixer Method: Combine dry mixture and liquid mixture in mixing bowl, mix with paddle attachment for 4 minutes on medium speed. Add egg; beat 1 minute. Gradually add remaining flour and knead with dough hook for 5 to 7 minutes until smooth and elastic. Place dough in lightly oiled bowl and turn to grease top. Cover; let rise until dough tests ripe. Continue with Shaping, Rising and Frying instructions below. Food Processor Method: Put dry mixture in processing bowl with steel blade. While motor is running, add liquid mixture and egg. Process until mixed. Continue processing, adding remaining flour until dough forms a ball. Place dough in lightly oiled bowl and turn to grease top. Cover; let rise until dough tests ripe. Continue with Shaping, Rising and Frying instructions below. Turn dough onto lightly floured surface; punch down to remove air bubbles. Divide dough into 2 parts. On lightly floured surface, roll each half into a 12 x 6 -inch rectangle. Cut with 2 ½ -inch doughnut cutter. Place on lightly floured cookie sheets. Cover; let rise until indentation remains after touching. In large heavy pot, heat 4 inches of vegetable oil to 400°F. Fry doughnuts a few at a time, turning once, until golden brown. Drain on absorbent paper towels. 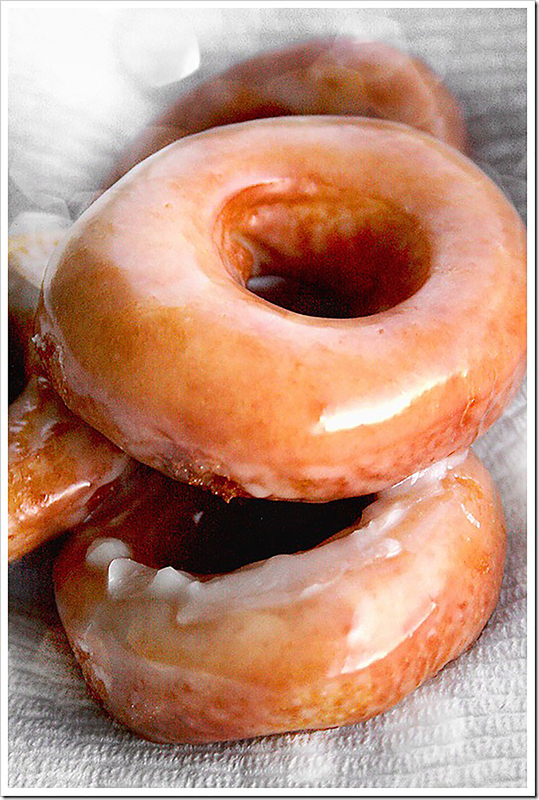 Glaze doughnuts (see below) or shake warm in a paper sack with sugar. Make Glaze: In small bowl, combine all ingredients and blend until smooth. Dip warm doughnuts into glaze. Place on racks until glaze hardens. It’s a measuring cup (not the one for liquids) that is used in baking and cooking for measuring dry ingredients. Tried this recipe it’s delicious soft and fluffy. My best doughnut recipe ever. Perfect tanx. I love it. Will these turn out if I leave out the egg? I would recommend using an egg-replacer, or substitute with ground flax seed: Combine 1 tablespoon of ground flax seed with 3 tablespoons of water to replace one large egg. How long should I leave the dough to rise? What about high altitude? We are over 3500 in elevation? From the FAQ section) The low atmospheric pressure at high altitudes allows yeasted doughs to rise faster causing the dough to over proof. Recipes need to be adapted for lower quantities of yeast as altitude increases. This will slow down the rising time so that the dough has time to develop a good flavor and texture. When baking at higher altitudes, use regular active dry yeast (not instant yeast) and use 1/2 teaspoon for each cup of flour, though this will vary from one location to the next. You will have to experiment with what works best for your area. In dry climates, flour is drier, causing dough to require slightly more liquid. In addition, liquids evaporate faster at higher altitudes. Check the dough during mixing, and add more liquid, one tablespoon at a time, as needed. When using a bread machine, it is extremely important that the dough be checked about 5 minutes into the kneading cycle. Without stopping the machine, raise the lid and touch the dough ball. Look for a soft, slightly tacky dough. Correct a dry, stiff dough by adding more liquid, a teaspoon at a time. Colorado State University has recently revised Making Yeast Breads at High Altitudes, to include bread machine and knead-your-own bread recipes and trouble shooting tips. Visit http://www.cerc.colostate.edu for call 877.692.9358 for more information. One word.. AMAZING! I got 23 doughnuts and countless doughnut holes. I could have probably gotten the 2 dozen, but opted for more doughnut holes. These are fluffy, light and delicious. I weighed my flour and the liquid amount matched other recipes so I didn’t even worry if it would turn out. Your recipe is a keeper. Many thanks! Rachel – if you are using the bread machine, add all the flour to the machine at the same time. No need to divide. My question is why do you divide the flour? What do you do with the rest of the flour? Thank you for your inquiry. If you are following the ‘mixer method’ instructions, a portion of the flour is added for the ‘dry mixture’ (Dry mixture: Combine yeast, 1 cup flour, salt and sugar in medium size bowl), and the remaining is added later while mixing the dough (By hand, stir in enough remaining flour to make a firm dough). Can you let these rise overnight in the refrigerator? I want to make them for breakfast, but I’m not getting up THAT early! These make a delicious breakfast treat! You can let the dough rise in the refrigerator overnight for the first (bulk) rise. The next morning, let the dough sit on the counter for about an hour before shaping the doughnuts. You could try the second rise (after shaping the doughnuts) in the refrigerator overnight for less work in the morning, just know that the doughnuts may rise too much. Keep them covered with a greased plastic wrap. Let the dough come to room temperature before frying. Let us know how the doughnuts turn out! Share them on our social media (#redstaryeast or @redstaryeast). I want to try these but I’m confused about the instructions.The instructions only mention 1 rise, but here you talk about a second rise. Can you clarify? Thank you for your question. There are 2 rises in this recipe. The first rise is a ‘bulk’ rise after mixing the dough. The second rise is after shaping the doughnuts. I hope you find this information helpful. Let us know if you make these doughnuts! I made these today and they came out wonderful! In the directions it isn’t clear but you let the dough run through the entire dough cycle in the bead machine! Will definitely make them again! I agree, these doughnuts are a wonderful treat! I made a few changes to the instructions, hopefully this will help make it more clear which steps to follow when using the bread machine. This recipe works really well. Tried several batches ALL came out well. THIS RECIPE REALLY WORKS JUST BE PATIENT WITH THE PROOFING PART. Let us know how they turned out! Happy baking! Wow! I love these, my mom used to make something like these for us kids on a special day. I can’t wait to make. Yummy!